See the story by Earl Hodges on Nola.Com at the link below. And the photos from the articles here. Open House Season is once again upon us! 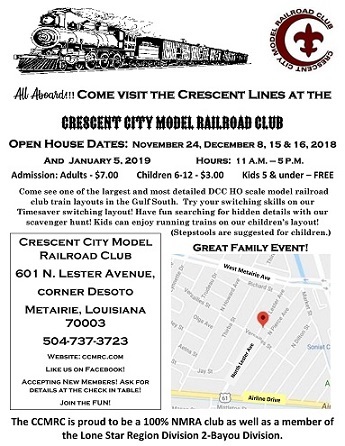 It's open house season again on the Crescent Lines! Come see the latest progress and projects and watch trains run! A Modeler's Life podcast show. 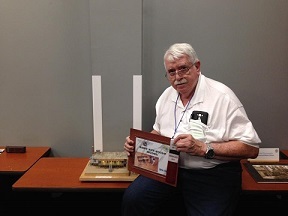 CCMRC members Maureen Mason, Ken Mason and Midsouth Model Railroad Club member Rod Fredericks, all of Division 2 took home a few trophies and ribbons from the Austin Eagle Lone Star Region NMRA convention this week. 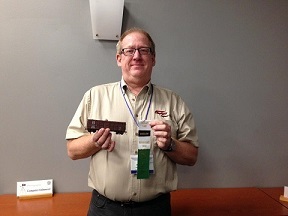 Division Director Ken Mason placed 3rd with a scratch built Santa Fe 1923 wooden box car, past Division Director Rod Fredericks took home 2nd place in kit built structures, and CCMRC Secretary Maureen Mason won 1st in the needlework category for her New Orleans Streetcar cross-stitch. 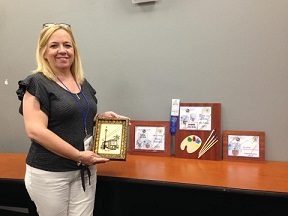 It also was voted most popular in arts & crafts and finally best in show for arts & crafts. Congratulations to the attendees from Division 2 for their success this weekend.